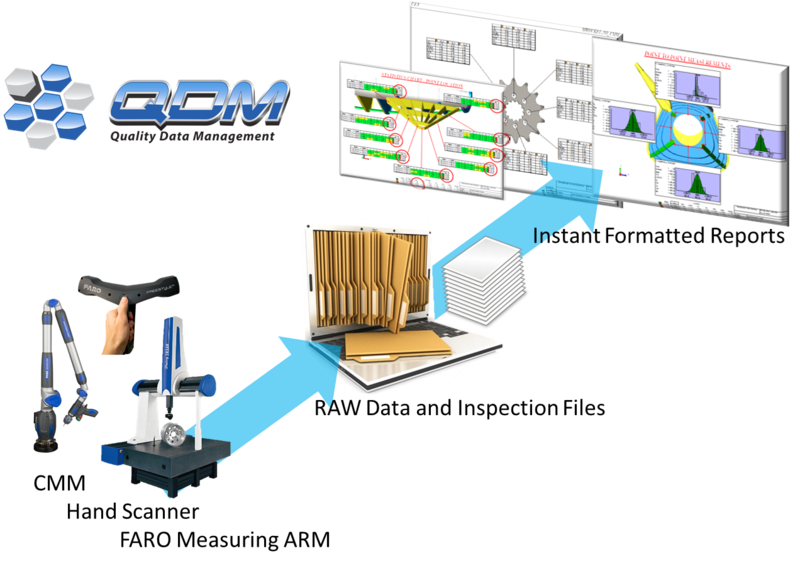 The QDM SPC System is a modular quality system that collects, standardizes and analyzes measurement data to deliver real-time insight into production quality. Organizing, analyzing and reporting measurement data can take a lot of time; time you don't have. The QDM System collects data from suppliers, plants, measurement devices (CMM's, laser trackers, hand scanners) and Excel and standardizes it into a single database. From here, you can view your data using forms, reports and dashboards, while setting up real-time monitoring and alerts. With the ability to view your quality instantly, you can find production issues before the line has to shut down, view your quality and metrics from anywhere on your phone or latop, and communicate quality information across your company. Standardize and automate quality reporting from: CMM's, measurement arms, scanners, suppliers and plants. QDM is a powerful quality system that gives you real insight into your production quality. The system provides a highly effective approach to managing, reporting and analyzing quality data, triggering corrective actions to be taken sooner rather than later, saving your company time and money. As a customizable system, it can be hard to figure out where to begin with QDM. QDM Deployments solve this issue by giving you three easy starting setups that can then be customized to fit your quality processes. Any of these systems can then be deployed on your network or in the Cloud. QDM is composed of modules, which makes it easy to configure and setup. These modules offer both Standalone modules which can be used without a System, as well as Add-on Modules which require a QDM Gateway to function. Find out more about QDM Modules by clicking below.